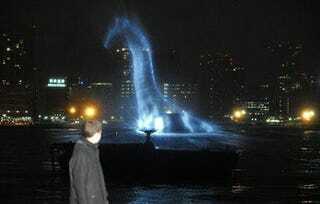 The upcoming movie "The Water Horse: Legend of the Deep" has prompted one hell of a publicity stunt in Tokyo Bay. The extremely cool effect illustrated above is achieved using a large water screen and some very well timed water fountains. In order to get the full effect, check out the video after the break. Seriously, I can't understand a thing that is being said, but I want to see this movie. Marketing magic!